First, I hope everyone had an awesome Fourth of July, I know I did. I spent the entire day on the beach, went home and stuffed my face with food, watched the fireworks in the Heights, then sat by the fire with close friends and family. It was a blessing to have such awesome weather after such a dismal-looking forecast. All right, now back to work. In the six weeks I have spent with the agency, I have come to recognize the ebb and flow of the workweek. When Monday rolls around, something every weekend warrior dreads, it seems like most people spend the majority of the day warming up for the week ahead. The first few hours are spent sifting through emails and finalizing work that may not have been completed the previous week. Actually, Monday’s are not as bad as everyone makes them out to be. 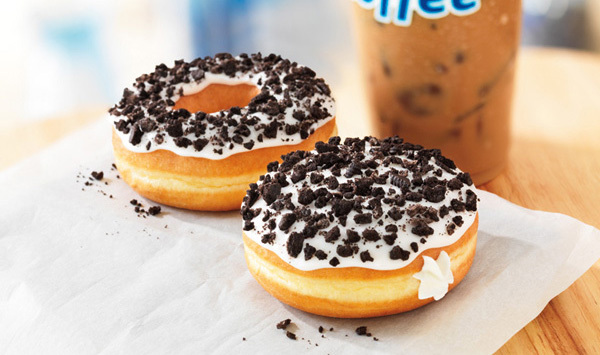 It takes a simple pleasure like a fresh “Oreo Crumble” doughnut from Dunkin to brighten a Monday morning. The next three days are generally very hectic. Work comes in as fast as you can finish it, clients are in and out of the office, and sales associates spend hours on the phone fielding calls on top of the work they are already doing. I keep very busy too, just in a different manner. In between projects, meetings, and blog posts, I spend my time scouring Twitter and news outlets for the latest news. Whether it be news specific to Cape Cod, insurance journals and blogs, or just current events, it is important for me to stay updated so I can write knowledgeable, informed posts. Friday is a clock-watcher’s nightmare. This summer has been a difficult adjustment for me to make, but I expect no pity when you read why. I am what most would call a “beach-bum”. I was raised that way, it is in my blood and it will forever be my lifestyle. My mother has taught to me to get to the beach early and stay late, and surprisingly it never gets old. I have been sitting in the exact same spot on the Heights beach for my entire life, and I cannot see that changing in the near future. We get some gorgeous weather here on the Cape, and it is different for me to be in the office all day while the beautiful weather passes me by. Fortunately, I stay busy enough for the time to fly by, but come Friday, I’m itching to go out on the boat, get to the beach, and just enjoy the beautiful weather with family and friends. Venturing out into the insurance industry has been a tremendous learning experience for me. Ultimately, the goal of an internship is to learn and experiment with career paths you might be interested in following. This does not mean that I am destined to be an insurance agent, but he time I will spend here is invaluable. I come from a heating oil background, it is what I know and it has provided for the “beach-bum” and “ski-bum” lifestyle that I live. It has been an interesting experience for me to learn how different industries, businesses, and people function. My father is very old-fashioned, but frankly, it suits the business and maintains efficiency. He does not need the most up-to-snuff software to run his company, in fact, his accounting entries are literally handwritten into a journal and then processed on the computer. The business is subject to price fluctuations and to some degree, legislation that regulates fossil fuel use. At the insurance agency, everything is computerized. We are virtually paperless; any paperwork that crosses a desk is scanned into the system and shredded. I have two monitors at my desk and a fancy headset that I honestly have no clue how to work. While my father will see a baker’s dozen of clients in an average workday, our office might see half that. The Falmouth office sees a vast majority of the foot traffic, whereas the Bourne office fields dozens of phone calls and emails. The insurance industry is subject to completely different outside influences. With the recent passage of the Patient Protection and Affordable Health Care Act, insurance companies are no longer allowed to deny coverage to clients for preexisting conditions nor can they place lifetime caps on benefits for clients. In addition, the mandate requires insurance companies to take on new clients, some with preexisting conditions and some that were perfectly healthy but could not afford insurance. While insurance might not be the path I choose, it has certainly been an interesting six weeks.